Firesara – More fun for life. Professional Swimming good brand with high quality and excellent customer service, make you enjoy your swimming best! 1.To clean goggles: always rinse completely under cold water to remove chlorine, salt, sand and other contaminants and allow to air dry in a warm, clean environment. 2.Do not leave your goggles out under direct sunlight as this can dry the soft silicone seals and fade its color. 3.Never rub or wipe the insides of your lenses as this can scratch or remove the anti-fog coating. 4.Protect your swimming goggles by storing them in their protective case (included). 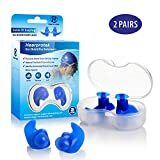 1 x Professional swimming nose clip. 2 x Professional ear plugs. 1 x High-Grade goggle cloth. 1 x Exquisite gift box. √ LARGE FRAME- -Firesara swim goggles’ flexible silicone frame and gasket provides maximum comfort. They come with super high sealing performance, integrating nose bridge design. Wearing without oppressive feeling, providing extreme comfort that never hurt your nose or leave a mark on your face. √ UV PROTECTION, ANTI-FOG, SCRATCH-RESISTANCE LENSES – -100% premium polycarbonate lenses with UV protection coating protect eyes from UVA and UVB, provide fair view broad sight in and out of water. They coated with anti-fog agent inside and are scratch resistant outside that can offer you a super clear sight. √ NON-SLIP DOUBLE STRAP – – Super high elastic double silicone strips, only one press operation buckle makes it very easy to lock and adjust. Double strap make more contact with the head,thus goggles would be stay up better. 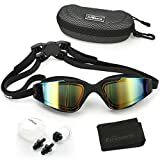 √ PROFESSIONAL SWIMMING ACCESSORIES – -You will get 1 Firesara goggles, 1 professional swimming nose clip, 2 premium ear plugs, 1 high-grade goggle cloth and 1 exquisite gift box. All that makes it become a perfect gift. √ 12 MONTHS GUARANTEE- -If you don’t absolutely love your new Firesara swim goggles, we will replace them or refund your full purchase price–NO QUESTION ASKED .If you have any question, please feel free to contact us, we will solve it at the first time.